Directions: Added to water, each tablet makes one 16 oz. drink. Easy way to add electrolytes to your body, the taste is very light but I found it a bit on the sweeter side...perhaps adding some lemon juice would make it tastier. No aftertaste, which is great! Great way to replenish electrolytes. Always bring a tube to tournaments to help keep hydrated. Better than liquid versions of electrolyte water because it takes up less storage space. Easy to use. Love this stuff. I work in a greenhouse and it gets really hot so I need electrolytes. Works great tastes great. This is one of my favourite nuun flavours. I think that it helps me recover after long workouts, especially in the summer. Yummy flavour, dissolves on its own, effervescent water! I think it really help me keep up my energy and recover during/after a long hike. My son likes all of the flavors of this product - a great alternative to the sugary sports drinks that are often consumed during hockey games. 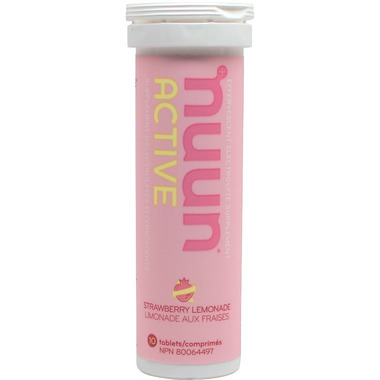 My husband and I both love nuun, after working out or just when energy is running low and we're running around. Throw it in a bottle of water and go. This and the berry are our favourite flavours! Love this flavour of Nuun. I find it works well and I always chug it after a run to replenish. I also love that it is not full of sugar and they are easy to carry tabs. Deff recommend.